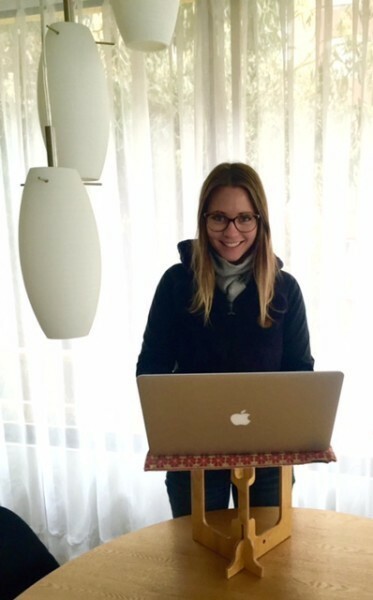 Our new product, StandStand Mouse, was funded on Kickstarter last week! 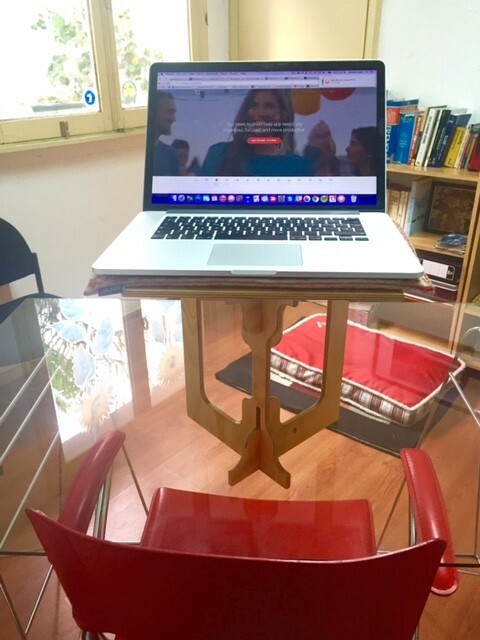 Check out our campaign page and updates to learn about this new standing desk option. Not only does it solve the problem that many laptop users loathe their trackpad like the flu, but meeting the design challenges of this new product gave me the opportunity to explore a more modern aesthetic that complements the classic look of the original StandStand standing desk. Read more about the iterative design process here! Production of the Kickstarter rewards is well underway, and we’ll be ready to take orders for StandStand Mouse on our website by the end of January. Drop me a line (luke@standstand.com) with any questions! The cost of labor in the US is much higher than overseas, and people often ask why we don’t aim for bigger margins by manufacturing in Asia. 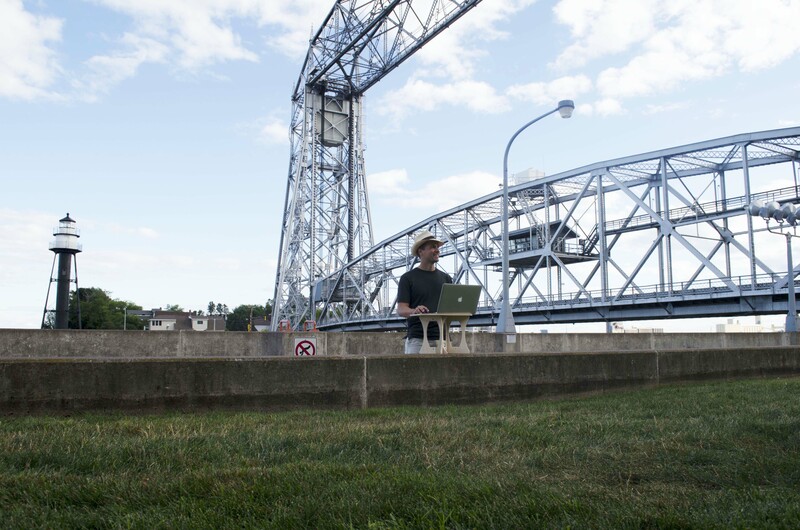 But one of the original goals of launching StandStand was to find a way to build a stronger connection to my hometown of Superior, Wisconsin. I wanted to work with my high school friend who now runs his father’s cabinetry shop, the shop where I worked for two summers in college. I also wanted to support jobs in the community that supported me along the way. Finally, after a decade of school that took me far from home, I wanted a reason to make frequent trips to the town where my parents still live. In the past, places of unique geographical advantages haven’t been very business friendly. The Twin Ports of Superior and Duluth were far from centers of business and finance, and slower communication made it harder to keep in touch with the broader world and market a product. But with the connections available through today’s technology, there’s no reason not to manufacture in a city where you can be in the factory at 3:30 and camping on a lake at 4:00. You’re closer to the outdoors. And when you live in a smaller community, you see your impact in the jobs you create, you borrow from the credit union where your neighbors deposit their paychecks, and you take greater satisfaction in the connections you are building. Now, whenever I visit the Twin Ports, I’m like a kid in a candy shop as I look out the window at the unique tapestry of natural beauty, historic buildings, homes, and shipping industry. I can’t get enough of it. Superior and Duluth boast a remarkable blend of nature and industry, which intersect and weave throughout livable neighborhoods. As we play our small part in that ongoing story, we’re committed to supporting a balance between economic development and a sustainable future. 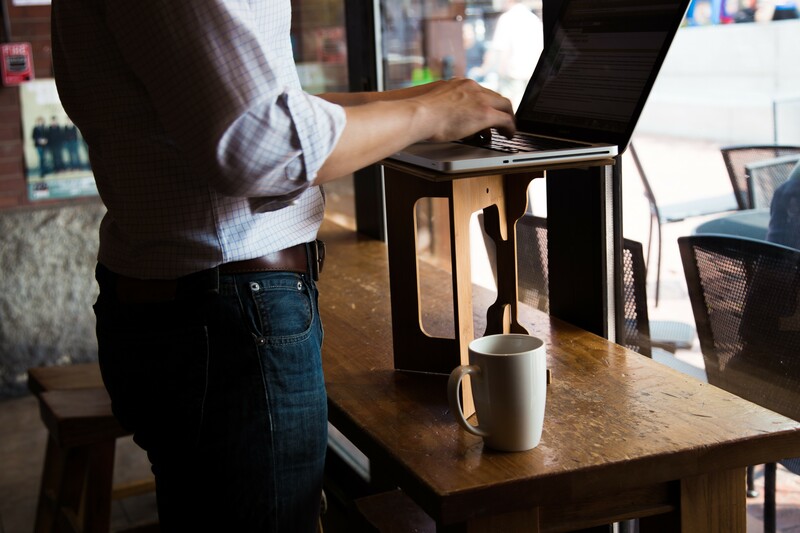 StandStand partnered with a small American manufacturer to produce our products. We understood that our “cost of goods sold” would be much higher because workers in the US receive higher wages than they do overseas. But in addition to the satisfaction we feel from building the local economy, there are some real benefits to this type of arrangement. Lower risk: One important benefit of partnering with a small US manufacturer is that it lowered the risk for our initial production run. 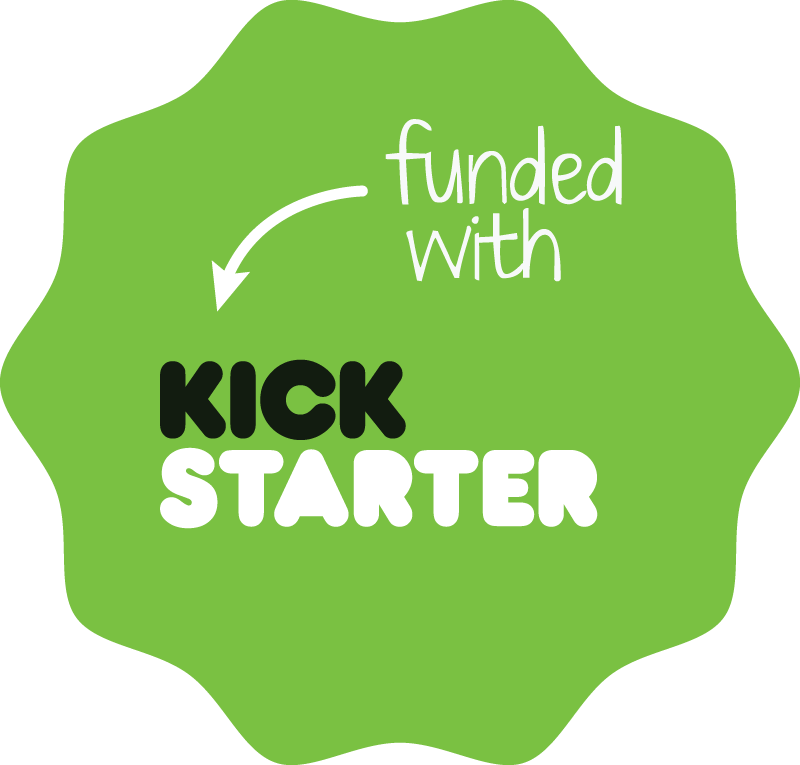 We were able to work together to match our production to the number of orders on Kickstarter, and after that, on our website. Manufacturing overseas would have required ordering thousands of StandStands to meet the minimum order for a factory and justify the cost of overseas shipment. So we would have needed a very large initial investment before we were sure about the demand. Access to the production process: Because StandStand is manufactured locally, I can get inside the shop and participate in every aspect of production. This not only saves costs, but it helps ensure quality control and constant improvements in our process. It also means that when I have a new idea to test out or a new design to prototype, it can happen immediately. Inventory flexibility: Since production and shipments don’t take months, we can manufacture StandStands as needed, keeping ahead of demand just enough to ship when an order comes in. That means we don’t need to have a lot of capital invested in inventory that is sitting on the shelves for weeks or months. It also means that our inventory won’t be outdated if we make an improvement to the design. 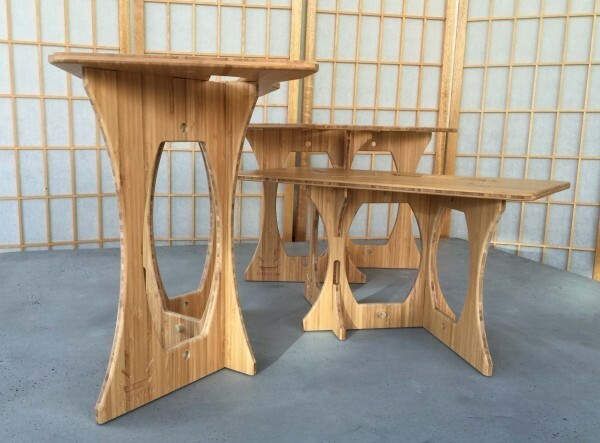 More support: Because the cabinetry shop manufactures a range of other products, the team that makes StandStand has a diverse range of skills and experiences. 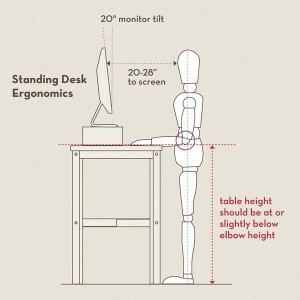 That gives them insight into how to make StandStands most efficiently. Their expertise and suggestions solve production problems and contribute to the ongoing design process. 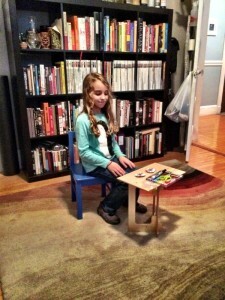 StandStand is not the only one to benefit from this arrangement. The American manufacturer benefits too. Diversification: Just like a diversified stock portfolio, manufacturing a variety of products creates a more robust system. The cabinetry shop already produces cabinets, drawers, custom tables, and millwork: by adding StandStand, they incorporate one more element to ensure that the team can keep working at full capacity even if there’s a temporary dip in demand for one product. Flexibility: Manufacturing StandStand has led the cabinetry shop to hire two new workers and add an evening shift in the finish shop to eliminate the biggest bottleneck in the production process. Those workers and that second shift would not be possible without the extra revenue that StandStand brings, and they give the cabinetry shop additional flexibility in meeting deadlines for their core products. New options: Working on StandStand expands the skills of the cabinetry shop team because they are working on a new process and paying attention to different details than they see in the other products. 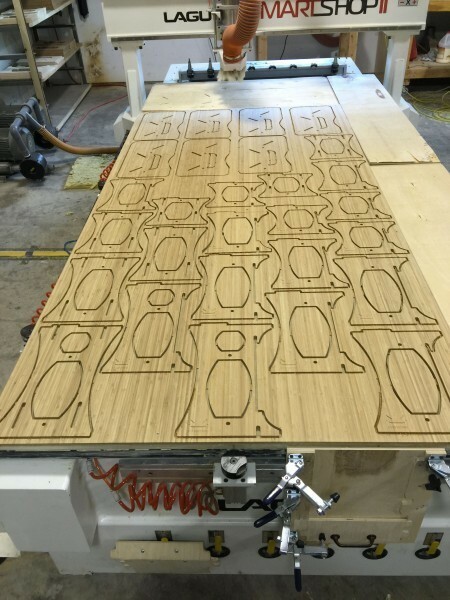 They now have access to StandStand’s CNC machine, which can be use used to expand their range of designs. In both these ways, the partnership enhances the cabinetry shop’s capacities in a significant way. Low risk: In exchange for their space and technical expertise, the cabinetry shop gets to work with a designer who brings in new energy and creativity. StandStand contributed the idea for this product and invested the time and money to prototype and launch it, and StandStand invested in the specialized machinery to cut out the panels. 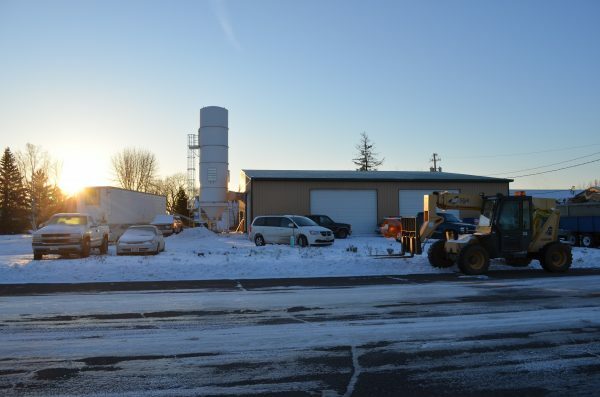 That means that the cabinetry shop did not need to take on much risk at all when adding these new capacities and accessing this new revenue source. Taking part in the ongoing revival of American manufacturing is inspiring, and we’ve found a way that makes it possible. Is this model replicable? Do you know of other examples? Share your thoughts in the comments! StandStand shows up at the tailgate. You can likely find many uses for your StandStand: while it’s designed as a portable standing desk for laptops, StandStand is so elegant and easy to move around that you might find yourself using it for your cookbook in the kitchen or a plate riser at the next Packers tailgate you attend. #HowDoYouStandStand? Your guests might use one for a seat and a second as a side table for their drinks. 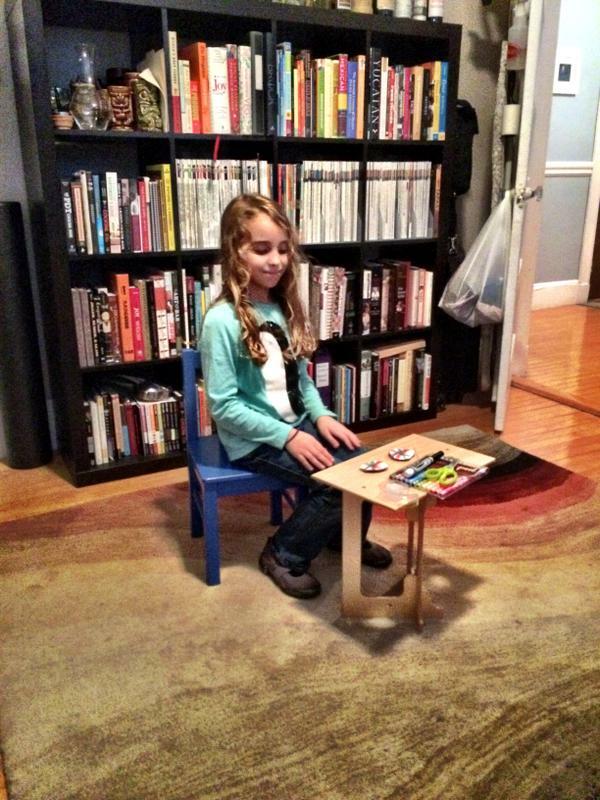 Your daughter might even find that StandStand is the perfect height for a tea party! 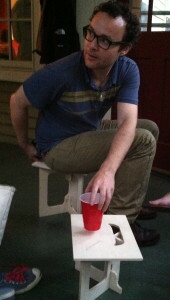 The host was lucky to have two StandStands when the chairs ran out! 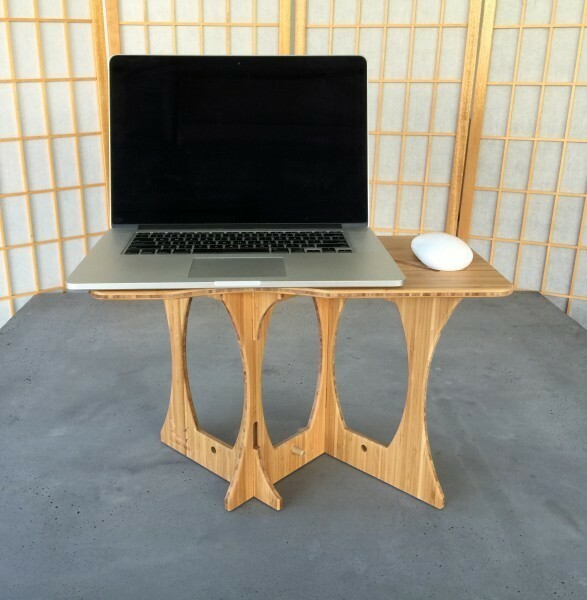 But when you use StandStand with your laptop, how you orient things can affect your computer’s stability. A question we often receive is whether the top face panel should smile at you or away from you. This could depend on where you want shine the StandStand love on any given day. But it is also a matter of stability. 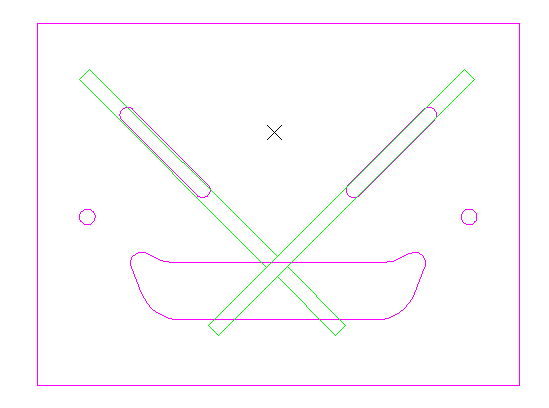 The key is for your computer’s center of weight to be over the center of the trapezoid formed by StandStand’s base. X marks the spot where your computer’s weight should be centered. 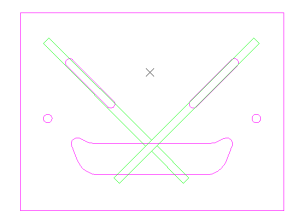 Base V facing away with a PC (left); base V facing towards you with Mac (center); heavy battery centered over the base V (right). With most PCs, the heavy screens and batteries near the hinge means the large V of the base needed to point away from you. For a more evenly balanced MacBook, I like to turn the large V towards me so that when I indulge my bad habit of resting my wrists on the computer, the weight of my arms is supported by the long side of the trapezoid. Depending on your computer, your StandStand might be most stable if the front extends past the edge of the top panel in order to center the weight more fully over the base V (as in the photo). On the topic of stability, you’ll notice some rotational play in your StandStand due to the flexibility of our birch and bamboo. (You can see the wood flex quite far without breaking in the dramatic stress test video halfway down our Kickstarter page.) But unlike the WorkEZ, which Dan Kois reviewed as “shaky and annoying” (in his amusing New York Magazine article, “Sitting is Bad For You. So I Stopped. For a Whole Month.”), there is hardly any movement as you type when you center the laptop’s weight over StandStand’s trapezoid base (especially if you don’t rest your wrists!). When used as intended, StandStand should not wobble. If it does, check that all four rubber feet are still attached (and set at the far edges of the base), and that all four feet make contact with a flat table surface. (Write us at info@StandStand.com if you need more rubber feet!) Ideally, your computer’s own rubber feet will make contact with StandStand’s top panel to prevent any sliding on the varnished surface. If that’s not the case, we’ll be glad to send some rubber feet that you can attach to the face panel or your computer to form a solid connection. As always, we love to hear from you, so drop us a line or send a tweet @GetStandStand! As you may know, we got started on Kickstarter, and we just wrapped up shipments for everyone this past December! 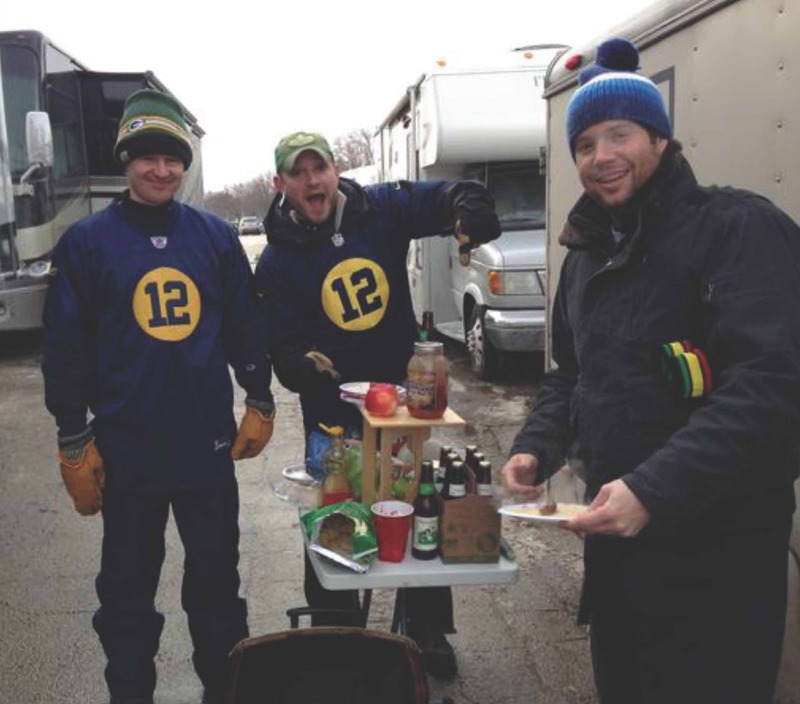 Emails and photos from happy backers have made this holiday an especially nice one for us. After all the hard work and uncertainty involved in a project like this, the satisfaction that we’ve been hearing has been such an encouraging validation of the project. Thank you!